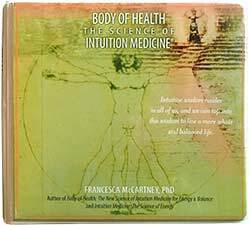 As a supplement to her books, Dr. McCartney has compiled eight hours of teachings and guided meditations. Distilled from classroom lectures and meditations, this eight-piece audio collection presents the essential skills needed to access intuitive intelligence and self-healing. The eight-CD audio set is available with either or both books, or alone. Each CD is also available for separate purchase or download. The contents of each CD/audio recording is described below. Being grounded in your body allows you to operate from a place of clear intuition and personal power. In this recording you will learn to sense, feel and strengthen your grounding connection. You will learn to recognize when you are ungrounded, and how to bring yourself back into your body. This is the foundation tool for the practice of Intuition Medicine. Benefits: Emotional well-being; mental clarity; enhanced physical health. Your aura is your protective cocoon, your energetic skin. Working with Life Force and Earth Energy, you will learn to sense, diagnose, and strengthen your grounding, chakras and aura. You will discover how a weak aura is a contributor to “dis-ease” in your physical body. You will also learn to create a healthy auric energy boundary. Benefits: Emotional protection and boundaries; strengthened nervous system; enhanced sense of personal identity. Chakras are energy centers located along the meridians of your body. They act as transmitters and receivers for your personal energy and the energy of others. You will learn the location and function of each of the major chakras, the telepathic chakras, and the chakras of the hands and feet. You will learn to sense, diagnose, and improve the state of health for each chakra. Benefits: Increased immune system health; enhanced psychometry and clairvoyance; enhanced practical intuition. Colors affect us constantly. Color is a universal language and is the primary language of intuition. Color works synergistically with all six senses. Music, body language and color are the only forms of expression that do not require language. This recording teaches you how to tone, heal and balance your energy systems with color. Presented are energy definitions of colors, and specific colors to achieve a desired emotional state. Benefits: Heightened awareness of colors for healing; ability to control your moods; enhanced clairvoyance. Kundalini is an energy that mystics and artists have used for centuries to tap into the creative secrets of the Universe. This recording presents a Western model of Kundalini that focuses on this energy as a tool for self-healing, spiritual growth, and enhancing creativity. You will learn the locations of the Kundalini meridians, and how to use Kundalini energy to clear and heal blocks in your physical and emotional systems. Benefits: Physical vitality; heightened creativity; expanded spiritual awareness. Our most important relationship is the one we have with ourselves. In this recording you will learn to sense and feel your inner male and female energies. You will learn to dialogue with your inner male/female. And you will learn to recognize the importance of nurturing the primary relationship in your life: your own. Benefits: Increased self-acceptance and self-love; healing of the reproductive system; improved relationships. Relationships with other people provide you with opportunities to grow, evolve and learn more about who you are. This recording will help you understand the purpose of your relationships. You will sense your energetic connections with other people, and whether they are health-giving or energy-draining. Benefits: Increased intimacy and integrity in all relationships; enhanced intuitive knowing; heightened compassion. The natural state of the Universe is abundance. This recording will help you recognize your prosperous nature in finance, career, health, and relationships. You will learn to release blocks and bring in your highest level of prosperity. A simple and powerful step-by-step prosperity meditation is given. Benefits: Feeling and knowing your natural state of abundance; enhanced clarity for decision-making; integration of prosperity and synchronicity in daily life .